WEST LAFAYETTE, Indiana, February 7, 2011 (ENS) – The Purdue University Board of Trustees on Friday chose wind and natural gas sources of energy over coal. 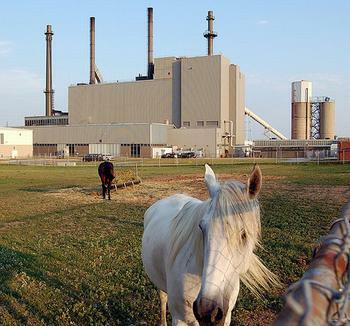 Purdue was the only university in the country planning to build a new coal plant. The Board halted plans to install a new coal-fired boiler and instead will ask the Indiana Department of Environmental Management to alter the university’s operating permit to allow installation of a natural gas boiler. The change follows an evaluation of the assumptions made at the time the boiler was first planned along with current and projected cost estimates, said Robert McMains, Purdue vice president for physical facilities. A drop in gas prices and the likelihood of future regulations with respect to coal use and ash disposal were factors in the university’s decision, said McMains. The university’s other natural gas boiler, approved earlier, is expected to be online by the next heating season. Purdue’s Wade Utility Plant supplies steam for heating and chilled water for cooling as well as about half of the electricity for the West Lafayette campus. In a separate decision Friday, the Board approved a plan to the leasing of land for a 60-turbine commercial wind energy park. The 100 megawatts of electricity the wind park could produce – enough to power 25,000 U.S. homes for a year – would be sold to a utility. Some of the power could be an additional energy source for the university. University students would be able to use the wind park for research and educational purposes. The project of the university, Purdue Research Foundation, General Electric Co. and Performance Services Inc. is proposed for Purdue’s Animal Sciences Research and Education Center, ASREC, and adjacent private property. The location was selected for its ideal wind conditions. Purdue Research Foundation would handle leasing arrangements for about 1,600 acres of Purdue land 10 miles northwest of campus in northern Tippecanoe County, where half of the turbines would be built. The other half would be erected on more than 2,400 acres of private property north of ASREC known as Performance Park, a proposed Performance Services wind farm. Performance Services would serve as the design-builder on both properties. It is conducting negotiations with a major financial investor for the commercial venture. Construction requiring about 200 workers would begin in April 2012, and the wind park would be in operation by the end of that year. The combined operation would be among the first large-scale commercial wind parks with a focus on research and education. Development of the energy park is contingent on replacing ASREC’s animal-waste management system, which uses outdated center pivot irrigation technology. Plans are to install a state-of-the-art animal waste treatment facility with a methane digester to generate electricity. Akridge says the energy park could create opportunities for research into animal waste management systems for Indiana farms. An important component of the energy park project would be a Welcome and Innovation Center, with opportunities for education from kindergarten through the university graduate level. This outreach conforms to Purdue’s land-grant mission to serve the public through discovery, extension and learning.